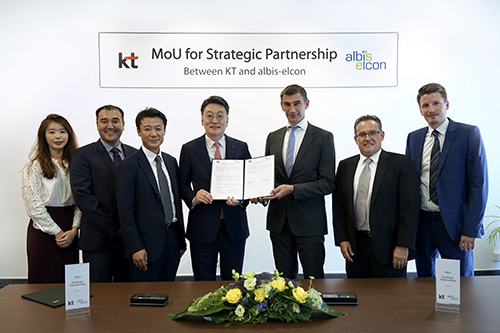 Hartmannsdorf — July 12th, 2018 – albis-elcon, the Germany-based network equipment and solution company has signed a Memorandum of Understanding (MoU) with South Korea’s leading telecom company “KT Corporation” to work together in potential business opportunities and collaboration in relation to GiGA technologies and associated wire-line and wireless technology platforms. The MoU was signed to reinforce the collaboration between the two parties on GiGA Wire and other GiGA technologies (GiGA Wi-Fi, GiGA LTE, etc.) business expansion in the countries where albis-elcon has been conducting its business activities globally. The two parties also agreed to pursue a Research and Development (R&D) collaboration for the future improvement of the aforementioned technologies including accommodating market requirements and technology enhancements. Furthermore, KT Corporation and albis-elcon will collaborate on the development of 5G network solutions and various platform businesses in the area of energy management, security and IPTV supported artificial intelligence solutions. “We are very pleased to collaborate with albis-elcon, which is expanding its business all over the world based on Europe, and KT has established another bridgehead for global market penetration,” said Hyung-Joon Kim, Executive Vice President, Head of Global Business Unit at KT Corporation. “New products and new solutions require innovative ideas, solid technologies and detailed implementation to guarantee first class user experiences. KT’s outstanding expertise will enable us to actively drive the development of future networks including the creation of new business models and operational excellence for our customers”, said Werner Neubauer, Chief Executive Officer of albis-elcon. KT Corporation, Korea’s leading telecommunication service provider, offers mobile services and fixed-line telephone services, including local, domestic long-distance, and international long-distance fixed-line and voice over Internet protocol telephone services, as well as interconnection services.